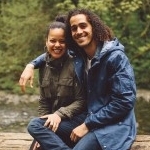 Home A VEGAN GUIDE TO PORTLAND, OREGON + more PDX guides! So let’s start with probably the main reason why you’re here, what we ate! First stop, Sweet Hereafter. Sweet Hereafter is a gem, because it’s a vegan bar! How many vegan bars do you know of? Me, not that many. Close to zero. (Lemme know if you know of some though, because I’m seriously interested.) It’s a rare treat to be in a bar environment & be able to order anything off of the menu. It is very difficult for me to not order vegan mac & cheese when it’s available so I jumped on the opportunity. & oh my, it did not disappoint. I thought I was being slightly dramatic when I made the claim that it’s the best mac & cheese of my life. But nope, it is. Please try the mac & cheese. I felt like I would being doing a disservice if I didn’t go to one of most popular doughnut shops in the US, Voodoo Doughnut. Keith and I tried to go there on our first day in PDX, but were becoming hungry (more so hangry, for me) & were not going to tolerate the long line so we decided to go the next day. We went to Blue Star Donuts knowing they have vegan options. On the day we arrived they only had one vegan option. We decided maybe it would be better worth our time to go Voodoo so we could have multiple options. So we didn’t technically eat here, but I wanted to mention it because there are vegan options there. 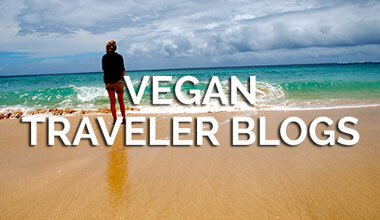 The VeganTravel gang checked it out, so see their photos here! This is not a beautiful example of how delicious this meatball sub is from The Bye and Bye. IT WAS SO GOOD. ANOTHER vegan bar and sister business to Sweet Hereafter, we found ourselves eating in the dark and creating a less than stellar photo. You won’t be disappointed if you get this sub! & heck yes, for another vegan bar. I love Portland. For Keith and I’s anniversary we went to Farm Spirit for dinner. It was the best meal of my life. Everything was beautiful and SO DELICIOUS. I am not a food critic, so I don’t have anything floral to say, but if you want to see what we ate for this multiple course dinner click here. It might seem obvious now, but Food Fight! Grocery is a completely vegan grocery store. Established in 2003(!) they have SO MANY vegan products. Mostly food products but also carry lifestyle products as well. I got a patch. ???? I love Herbivore Clothing! A vegan apparel company that I have been a stalker fan for years, it was lovely to see their whole line in person. (I had seen some of it at SoCal VegFest last year.) You may notice some of the people in the photo. ???? Scapegoat Tattoo is a vegan tattoo shop that is available for all of your tattooing needs. Didn’t know tattoos are not vegan? More deets on ingredients can be found here. We didn’t end up eating at Sweetpea Bakery Company because we still full from lunch but I’m definitely interested in the future! Powell’s Books is a popular destination in PDX full of used & new books. 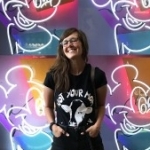 It’s worth checking out to see it’s massive collection and there are cute Portland souvenirs, too! Books are always great souvenirs because if you read them while you’re traveling it’ll always remind you of that place. Keith chiming in here. There are many things Portland is known for and one of them is music, they have many great vinyl stores! Above we have Music Millennium, essentially a tri-leveled music store with an extensive vinyl selection. No matter what your preference they got it. If your willing to shuffle through the catalog you will find a steal. 2nd Avenue. I feel like this name should be synonymous with Portland as a must go. It’s fun, small, offbeat everything you would come to expect in a mom and pop store from Portland. Even if they don’t have what you’re looking for, they will find you something new that you haven’t heard of yet. We were advised to go to Portland Farmer’s Market and Portland Saturday Market. Both are great for different reasons. Head to the Portland Farmer’s Market for more produce and food. We got coffee and boysenberries. Then you can head to Portland Saturday Market for more a shopping scene. Here’s a little Snapchat of the Airbnb we stayed in. It was a really nice location for our needs. It was fun to be out on the town but lovely to return to a comfortable forested neighborhood. Our Airbnb host even had vegan bath products and she wasn’t even vegan! (I’m assuming.) Keith and I LOVE Airbnb and it will always be the first place we’ll check for accommodations. We’ve actually booked with Airbnb MANY times, so we have our best tips to find the perfect accommodations. Also, if you’re interested in creating an account, feel free to use this link so we both get some free cash. 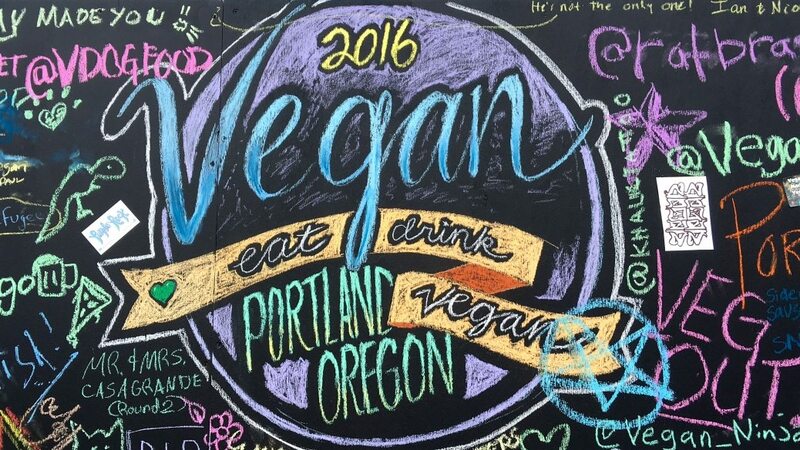 A GREAT time to visit Portland is during Eat Drink Vegan! I’ve heard it referred to as the vegan Coachella. ???? Originally called Vegan Beer Fest, it has evolved to more than just beer and vegan food. There is beer, wine, kombucha, food, shopping, music + more. There’s fun for everyone. ???????? I’ll have a blog post about Eat Drink Vegan in the future, but of course we vlogged the experience (and we went to Eat Drink Vegan, Los Angeles, too!). So I know I’ve mentioned these vlogs enough throughout the post, but ⇡ this one ⇡ has Heart Coffee Roasters, Powell’s Books, the vegan strip mall, Farm Spirit, The Bye & Bye. & ⇡ this vlog ⇡ has the farmers markets, Voodoo Doughnuts, Sizzle Pie, Herbivore Clothing, & vinyl. We also talk in depth about Thai Chili Jam at the end of this vlog, so if you want to hear our commentary on some really ???? Thai food, you can find it there. & ⇡ this ⇡ is the playlist of the whole trip, starting with what I packed. ???? Not only do I greatly enjoy making vegan travel guides, but I am definitely a consumer of other’s guides! 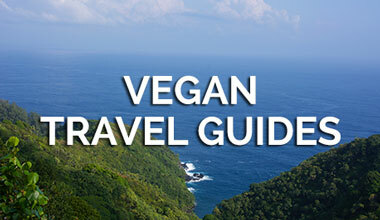 These guides will definitely help you find your way around Portland, vegan style. 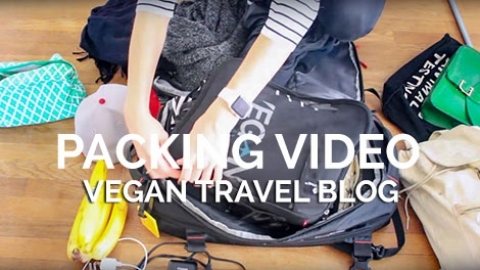 ▶︎ VeganTravel.com! 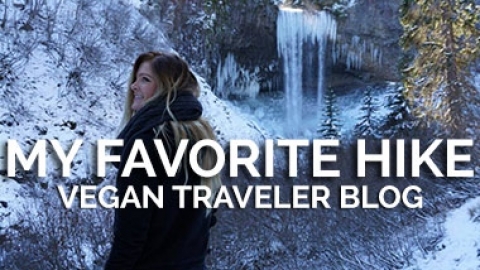 This website has created a community around vegan & compassionate travel and will always be a well-rounded, updated resource. 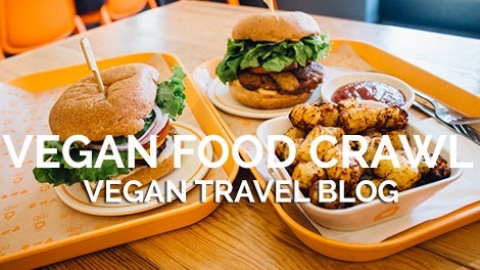 Searching “Portland” on VeganTravel.com has many results! ▶︎ The VeganTravel.com team also went on a vegan food crawl throughout Portland, so check out this blog post rounding it all up + gorgeous photos by Shannon (@AnotherHungryVegan). ▶︎ Food Fight Grocery created a GREAT PDX guide. Because they are a local business they’ve included vegan businesses (outside of food), Airbnbs, vegan and vegetarian options. ▶︎ The Minimalist Baker (I’m sure you’ve heard of this blog before, but if you haven’t– great vegan, MINIMALIST recipes!) has a very comprehensive Portland Dining Guide including their favorite breweries. ▶︎ In regards to things to do, Shae & Marissa of VeganTravel.com created a video on some activities you can do in Portland to go along with their vegan food tour of Portland video. ▶︎ Kristin, also from VeganTravel.com & Will Travel For Vegan Food & Mandi made a video Vegan Food Tour of Portland (+ activities) as well! More info in their blog post. ▶︎ More drool-worthy photos and commentary of the Best Vegan Eats in Portland can be found on Rika & Doni of Vegan Miam‘s roundup. If you’re thinking about visiting Portland, the Portland VegFest in October of this year! Imagine going to a VegFest in the one of the most vegan-friendly cities IN THE WORLD? There seems to be many vegan guides to Portland, Oregon, so if you’ve documented your (vegan) travels throughout the city, feel free to include links in the comments below! 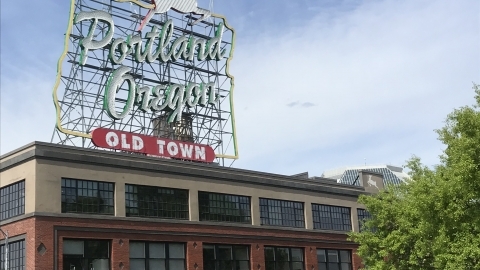 We hope you found this guide helpful & we know you’ll have a great time in PDX. 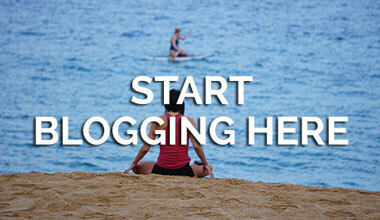 Feel free to let us know if you used this guide on social media when you get there. @city_loveee on Twitter and Instagram. ???? P.S. 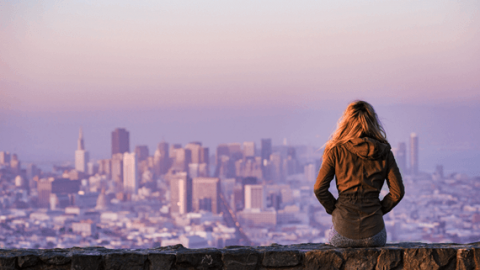 – If you are local to us, Southern California, there is a deal for LAX⇢PDX (roundtrip) for $128! (August 2016 – February 2017). I’m sorry to hear Blue Star did not have that many options! They’re my favorite place to snack. Agreed! I would love to have gone to Portland 20-30 times! Amazing.